From that moment on, he was absolutely on Auto-Pirate. Things I’d walked as a bending 5 strides happened in a direct 4, because he was so bold, fast, honest and straight that there was no sense touching him. Fences that walked huge seemed small; lines that appeared tricky and technical were made to feel easy. The only slightly nervous moment was early on when he jumped an enormous brush on the hill and sort of ran off with me (oops), and the “A” element of the water was upon us much quicker than expected. He was a bit wild over that jump as he noticed the water (and skinny brushes IN the water), wobbly in the following 2 strides, and green-ish on the jump in as he figured things out, but he was brilliant getting through. The announcers kept saying I had my “work cut out” for me at the table-to-corner combination and was doing a great job of “keeping the lid on” as Pirate was looking “very, very strong,” but I had to laugh because I honestly felt like as long as I put my eye on the fence, settled him slightly, and kept my leg on (it really is our best friend in every situation, isn’t it? ), Pirate was absolutely going to jump anything in his way. He’s brilliant like that and always has been. I suppose the coffin wasn’t the smoothest combination for us, because he sort of, umm, ignored my half halts, and that lovely bouncy coffin canter never really happened, but with brush fences in and out (who cares if they were big and skinny and offset), it didn’t matter that he was a bit, err, more forward than planned through there – he still popped over the angled ditch in between (which he noticed in the air over the “A” element) and pulled me into and out of the line like an old-school Irish foxhunter, not stoppin’ for nothin’! That feeling of him landing over every fence looking for his next, as if he somehow knew where it was and how to handle it, is one of the very best of my life (and how we finished clean and fast, with me kinda teary-eyed and emotional because I am SUCH a girl when it comes to my boy)…yes, Auto-Pirate for sure. Now if only I’d just kept him in Auto-Pirate for stadium instead of trying to take over myself! 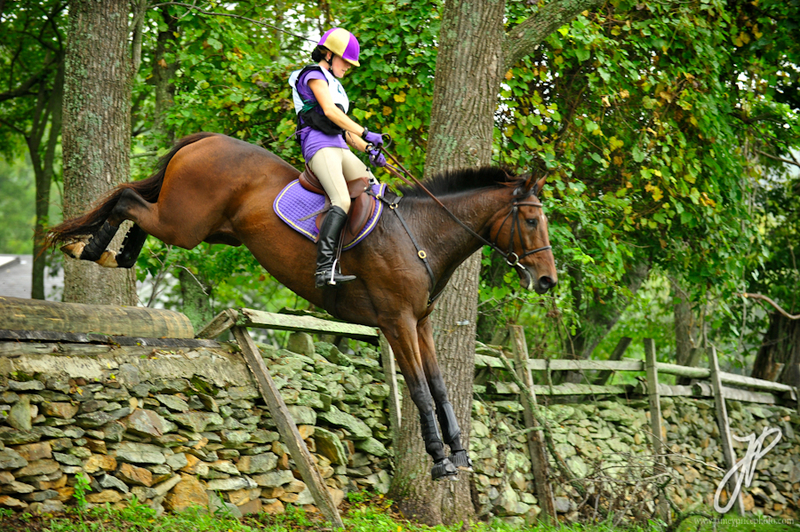 It took me to fence 5 to finally get out of his way (and actually put my leg on – D’OH!) so he could start jumping the way we all know he can. If only we (read: I) hadn’t had those couple of rails down…but isn’t this a game of “If only,” after all? So, onto Middleburg…the weekend in between AEC and Middleburg I taught a clinic for Clemson University’s Eventing team and had an absolute blast with all the girls, and then a few days later Pirate’s very own personal photographer hit the road to Northern Virginia with us to go jump around at Glenwood Park. We went up a day early to visit family in the area, and P spent the night at a very fancy dressage barn (P thought he was staying at the Ritz for the night…the footing for the indoor arena cost more than my house), where the German Grand Prix rider/trainer who owns the whole operation saw him go and told me what a very, very nice horse I have and even gave me a couple of tips on how to make him go that much better. I was over the moon with her compliments and advice…and even MORE over the moon when he trotted up centerline on Saturday and scored in the low 30s to put him 3rd (yes, THIRD, behind Rebecca Howard and Karen O’Connor!) 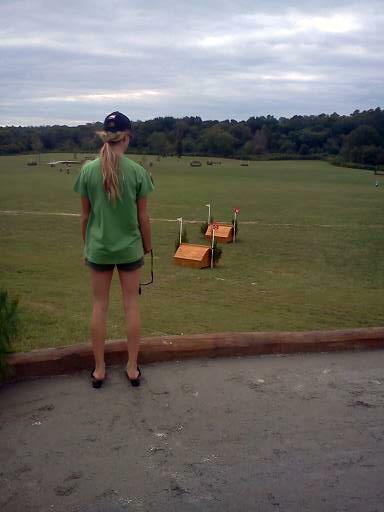 in a division of 26 that included a handful of lovely Advanced/CCI*** horses. I was ecstatic (an 8 on my riding, oh my!) and I would like to think Pirate was proud of himself, even though he was probably just sucking up to me so I’d let him onto the cross-country course that was RIGHT next to his dressage arena. Okay, so…here’s another “If only…” stadium round. If only I had put in bigger studs (rain, mud, trailer getting stuck – say enough? ), if only he wasn’t so freakin’ scopey that he jumped in HUGE to the double, if only he wasn’t trying so hard to make room for himself in the triple (after the double incident) that he jumped out of the line altogether (hello, left leg, where are you and why aren’t you closed?! ), if only we could have turned instead of having the feeling of no footing underneath us and having to go waaaay around the fences we wanted to turn inside of…if only all these things had gone differently, we wouldn’t have ended up with a bunch of stupid time penalties (and two down) in stadium. It was just one of those rounds where I came out saying, “Really, Kels, REALLY? !” I say that a lot after stadium, though; I’m the first to admit it’s a tough mental game for me more than anything, and I’m betting the second I get out of my own head, we’ll start having clean rounds. I’ve said it once and I’ll say it again – that horse is too good to have a fence down. I have them down, not him. I know how to be better, and I WILL get it together. Promise. Cross-country ended up being one of those rounds where I just wanted to get him home safely. He always jumps well, but I got a line all wrong early on and had to circle to fix it (really, there was NO way to get him to the next fence where I put him – where WAS my head that weekend?! ), giving us the ol’ 20 penalties…oh P, you are so forgiving when I ride like an untrained monkey. He was brilliant over the trakehner combination; and the corner combination; and downhill skinny brush that was taller on the landing side than me in my clogs (inch or two of height on them, so they make me 5’9″…) and jumped out of pure mud by the time we went at the end of Intermediate; and coffin (that I totally galloped past and had to go alllll the way back across the field to get to – again, what was I thinking?! ); and table-sharp turn-skinny-stone wall drop combination; and oxer-to-corner… He gave me a bit of a scare over one table when he slipped on the take-off, but in his brilliant style he made it over flawlessly. The water was very late in the course and by far the biggest we’ve ever seen. There was a skinny on the hill followed by a right turn, and a downhill approach to rails, one stride, BIG drop in, right turn in the water to a narrow log out…it was definitely a “kick ‘em into the hand” kind of fence, where the bouncy coffin canter was absolutely necessary, not to mention the right line. My Pirate was absolutely phenomenal for me there. I laughed when I watched the video and heard people laughing at me when we jumped the C element, as I yelled “Holy God you’re the BEST, good BOY!!!! 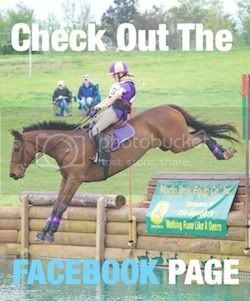 !” As I’d done for most of the round, we went super slow to the last couple of fences, and I couldn’t have been more proud of my boy when we finished up. I quickly discovered he’d halfway ripped off his right hind shoe, which explained the scary moment at the table, and was even more in love with him than ever for jumping around so well in spite of it. That’s when it started…this little feeling in the pit of my stomach that something wasn’t quite right with my boy. There was no heat, swelling, obvious pain….but something was just not quite right. I was kind of a nervous wreck over the next week and a half, waiting to take him down to Tiffani’s vets so they could look him over. In three vet visits (one at Tif’s, one up at my place, and one down at their clinic in Camden), we went through major scares, me both feeling like a terrible momma for hurting him somehow and being overwhelmed by how stoic my horse is; a bit of surprise; and finally much relief to discover it wasn’t nearly as bad as we had at one point suspected. The verdict (in simple terms) is: Pirate’s right hind suspensory ligament is irritated and enlarged, and he has a tear in the fascia surrounding it. Clever boy that he is, he performed his own fasciotomy! (So very proactive…oh Pirate, how like you to be an over-achiever!). XC at AEC's was easy for the Auto-Pirate. The good news is, he should be just fine. (I don’t want to jinx it by saying that, but we have every reason to believe this, and I’m more of a “good vibes, positive energy” kinda gal; negativity won’t help a thing). High suspensory injuries are relatively common in horses with Pirate’s job, and all that “sitting down” in the dressage is a big part of that. (Pirate says, “HAH, I so told you I’m allergic to dressage, and now it’s making me broken! HMPH!”). The bad news is, his life will be rather boring for a while. Rest, and walking. That’s it. Oh yeah, and shock wave therapy. I’m not even going to discuss how much this is costing, because I kind of want to throw up…thank heavens I put a little money away in savings over the summer, though this will absolutely make me even more broke than usual…and that’s pretty dang po’, trust me. (I can’t even afford the second 2 letters of that word, that’s how bad it is). Hell, it’s only money, right? And this is Pirate we’re talking, here. He’s the reason I do any of this, so there’s no reason to hang onto those dollas – it’s all for him. 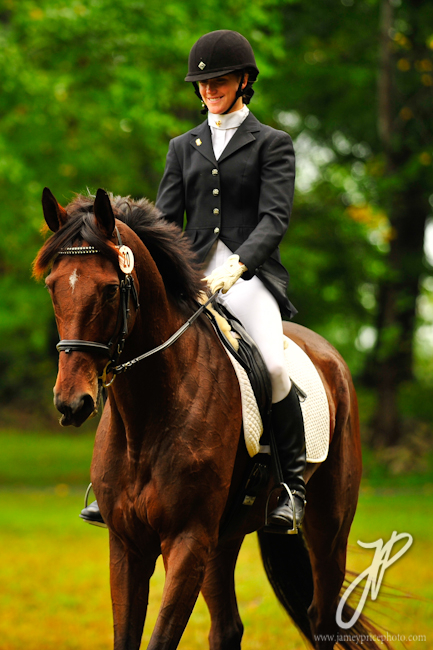 Much as I love what I do, I will forever be more in love with that horse than the sport itself. If I’m broke forever, at least I have my Pirate! Anyway, I have plenty of time to focus on making the money back so I can actually afford to compete him again when he’s ready to come back…we all know how much he loves what he does. I’ll make it happen because I always have, and I always will. Pirate deserves at least that! So anyway, it’s looking like I’ll be wearing no white breeches for the next little bit…it’s well past Labor Day, and we can’t be making a fashion faux pas, now, can we? It’ll only be cream or mustard colored breeches on on the foxhunt field this fall, and perhaps winter white if I take the youngsters out to compete. But as soon as temperatures are back on an upward swing, and Pirate’s life gets a little more interesting again, you better watch out – I’ll be sporting not only the white breeches, but the white skinny jeans with the black “Beware of Pirates” shirt…and there is no one who will talk me out it! Posted in Blog and tagged with 3 Day Eventing, aec, American Eventing Championships, Cross Country, Dressage, FEI, glenwood park, Horse trainer, Intermediate, Kelsey Briggs, Kelsey Briggs eventing, middleburg, middleburg horse trials, Off Track Thoroughbred, Show jumping, The Gentleman Pirate, United States Eventing Association, virginia. RSS 2.0 feed.